Vaka Takitumu maiden Natalia Short is the Miss Cook Islands 2015. Holding back tears of joy, Short took her first walk as Miss Cook Islands 2015 in front of a standing ovation from a large and vocal crowd that gathered at the National Auditorium for the Miss Cook Islands Association finale show. It was confirmed at the crowning ceremony that Short will represent the Cook Islands at the Miss World Pageant to be staged in China among her long list of prizes, which include a new car. Mangaia warrior princess Allanah Herman-Edgar came first runner-up, was crowned Miss Earth Cook Islands and will represent the country at the Miss Earth Pageant. Karika descendant Tumanava Wilmott was crowned Maine Purotu Manava with the remaining pageant category titles announced at the extended prize giving ceremony on Sunday afternoon. 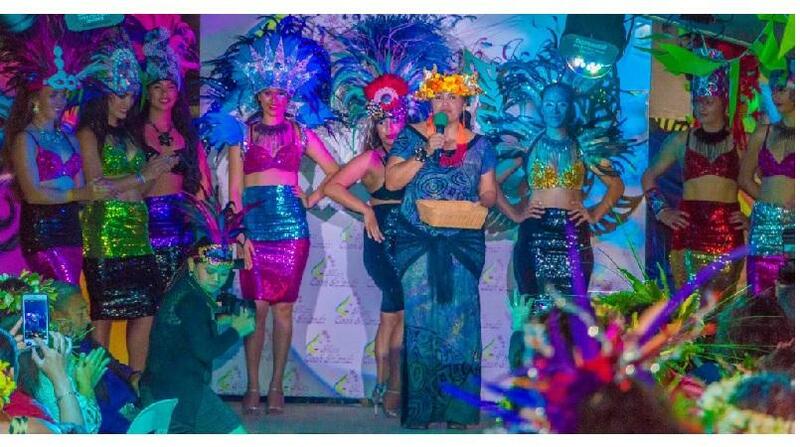 Dressed in their best and adorned in colourful flower ei, the vocal crowd was treated to another national pride-inducing evening with the 10 Miss Cook Islands contestants and their behind the scenes team showcasing the wealth of talent in our country. A group dance by the contestants and powerful introductory orations in Te Reo opened up the nights show and set the tone for an evening filled with cultural pride and identity. Individual talents shone on stage as the 10 young women made the most of the spotlight to express themselves. Aloma Moore used the stage to highlight the need for more community discussions on domestic violence as well as showing off her singing and dancing talents. Cook Islands dance in its various forms dominated the talent category with Natalia Short lifting the roof off the auditorium with her exceptional drumming skills, combined with her well-honed dancing talents. Shontay Iro gave the audience a lesson in the evolution of Cook Islands dance and costumes with her bubbly and carefree nature helping to relax the crowd as tension built up for the traditional custom section and first elimination of contestants. Stunned awe was the reaction to all of the traditional costumes modelled by the contestants, as the detailed garments of natural fibres had spectator’s jaws dropping until thunderous applauses broke the awe-stricken. Grace Loki wore her national pride on her body with her costume designed to resemble the Cook Islands flag, while Reny Roi looked divine in a body-sculpting two-piece woven mat and tapa cloth garment. Polished shells had Tumanava Wilmott glowing on stage to convey her Miss Cook Islands journey from a rough dull shell at the start of the campaign to the polished confident woman she is after her journey. Mariana Ngaputa looked like a Hollywood star in a spectacular creation that would match any garment at the renowned World of Wearable Arts show while Natalia Short’s flowing tapa cloth gown revealed a shell bedazzled costume elegantly modelled by Short.